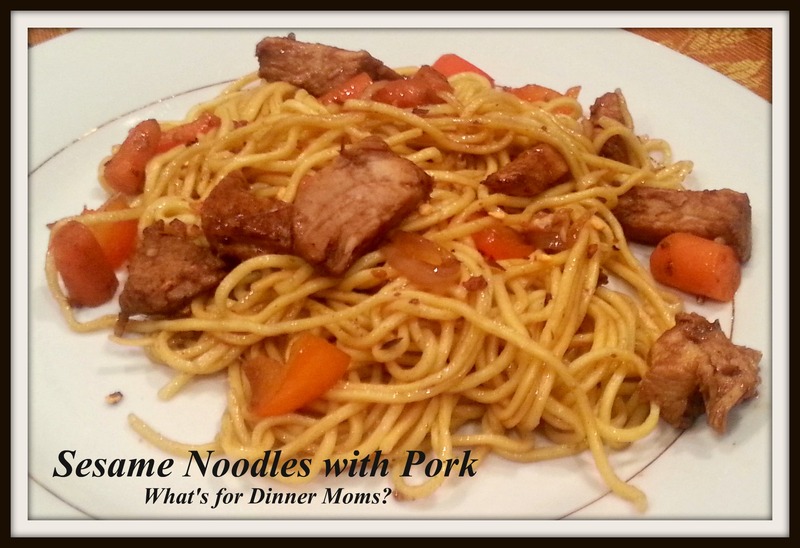 Sesame Noodles with Pork – What's for Dinner Moms? Being as frugal as I am, I wanted to use up the last bits of Glazed Pork Roast from the other night. But, dinner also needed to be on the table fairly quickly. If you have not used Chinese Chow Mein noodles before try them! They are better in Chinese noodle dishes than spaghetti and cook in about 3 minutes. They are a life saver on days when I am looking for a quick meal. Vegetables, meat, a Chinese sauce and noodles on the table in under 30 minutes. You can mix and match the vegetables, meats and sauces to match your families tastes. This was an awesome tasting dinner that was so easy to prepare. The most difficult part of the meal was cutting the vegetables and pork. The dish comes together in less than 30 minutes. Everyone loved this dish and even the next day for lunch it was even better! I served this meal with a side salad. Steam your carrots and peppers until slightly al dente but cooked. Remove from heat and drain water off. In a large heavy skillet, heat the canola oil and cook your garlic only 2 minutes until fragrant and transfer to a bowl. Add the rest of the sauce ingredients to the garlic and whisk together. Set aside. Cook the Chow Mein noodles, drain and rinse with cold water. Add the pasta back into the skillet (you may need to add a bit more canola oil) and toss around with tongs. Add the leftover pork and noodles to the skillet. Pour the sauce over the noodles and pork to combine, tossing to heat thru. Serve with red pepper flakes if desired.